The 2019 Havana Biennial will see artists from all over the world descend on the island for an entire month for free art expositions, workshops, and conferences. This year’s theme is “The Construction of the Possible” and hundreds of artists from over 40 countries have been invited. Enjoy VIP access, private meet and greets, and exposure to the island’s most popular artists. By leveraging this expertise and curated travel capabilities, Cuba Educational Travel offers a product that is unrivaled. Our strong presence on the island and in important cultural circles gives us unparalleled access and knowledge. This combined with the beauty and intrigue of Cuba and its people make for truly unforgettable experiences. Discussion about Cuban culture and art with a family of artists, at AltaMira art loft. A few years ago, Edel Bordón and his family embarked on a journey to establish an art collective in their apartment building. Spearheaded by his wife Yamilé Pardo, the family created the AltaMira art space, which features an exhibition and workspace off of the main lobby and collaborations with neighbors. Welcome dinner at Paladar Atelier. This restaurant is equally known for its atmosphere and exquisite cuisine. The lighting and textures of the house, which was home to a pre-revolutionary senator, coupled with walls adorned in modern art, create a cozy, but modern setting. Walking tour of the Old City. Wander through the Plaza de Armas, a scenic tree-lined plaza formerly at the center of influence in Cuba. It is surrounded by many of the most historic structures in Havana as well as important monuments. See the Plaza de San Francisco, a cobbled plaza surrounded by buildings dating from the 18th century, dominated by the baroque Iglesia and Convento de San Francisco dating from 1719. Visit the Plaza Vieja, surrounded by sumptuous houses of the Havana aristocracy from the 18th and 19th centuries. Visit Plaza de la Catedral de San Cristóbal de La Habana. Visit El Taller Experimental de Gráfica. The Taller is Havana’s printmaking and lithographic workshop. It is a studio, a school and most of all, an art institution that preserves and develops the sophisticated art of print making with relative freedom of spirit and form. Visit to the Museum of Cuban Art. We will be accompanied by Nelson Herrera, an art historian and curator for the Centro Wilfredo Lam, who will provide an overview of Cuban art and artists over the last four centuries. 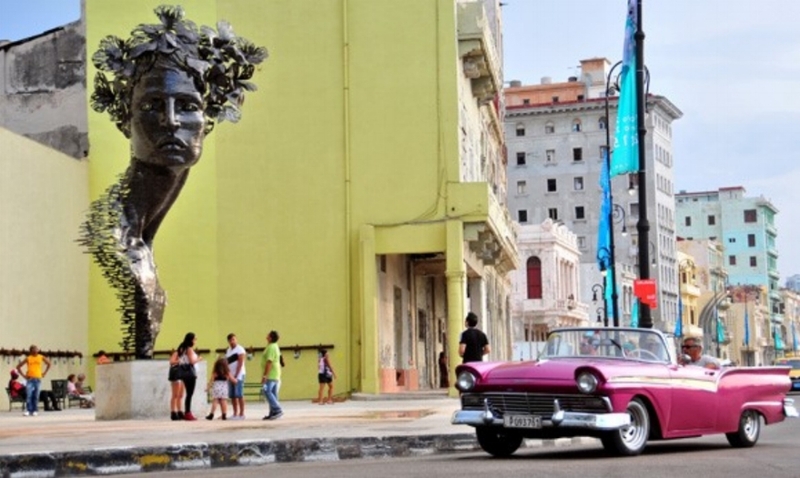 Explore Havana from the Vedado neighborhood to the Old City, walk along the Malecon (seawall) to admire the biennial pieces of art scattered all over the area. Visit to the Studio of Serones. They display a work carried out with four hands and with very peculiar traits. Antonio Álvarez and Alejandro Pablo Garcia have formed a small group to create together and establish a new academy on the landscape theme. Visit to El Oficio, a magazine dedicates to Cuban art and literature that focuses much of its work on emerging artists. Discuss the project with the Oficio team and check out the Oficio Art Gallery. Suggestion: Following dinner, enjoy live music, art and dancing at La Fábrica de Arte Cubano. Rock star X Alfonso has turned this into meeting spot for a young, eclectic crowd of Cubans and foreigners. Visit to La Finca Vigía. Formerly the home of Ernest Hemingway, today it still houses his expansive collection of books. It was here where he wrote two of his most celebrated novels: For Whom the Bell Tolls and The Old Man and the Sea. The beautiful grounds and bizarre tales from Hemingway’s many years in Cuba are captivating. Visit to the home and studio of plastic artist Fuster, who has converted his neighborhood into an art project featuring murals, plastic art and other designs. Enjoy a performance by Habana Compás Dance, which encompasses the rich rhythm and flow of the island, performing traditional and modern dances born from their Spanish, Cuban and Afro-Cuban heritage. Visit the studio of Esterio Segura, one of Cuba’s leading artists. Segura touches on many controversial aspects of Cuban society in his art work. Depart for a day trip to Las Terrazas, a small community and nature reserve in the Rosario Mountain Range, to the west of Havana. Guided tour of Las Terrazas Community and forest, focus on biodiversity and rural restoration program and a discussion with local residents. Interact with local artists. Visit the lakeside studio-gallery of Lester Campa, “the painter of the calm”. He graduated from the National School or Arts in 1987 and his work has been exhibited internationally in cities like New York, Washington, Costa Rica and Panama. Visit Ariel Gato Miranda’s studio, an artist who makes serigrafias (printings) with recycled paper, linen and wood. Visit Cafetal Buena Vista, Cuba’s oldest coffee plantation, built in 1801 by French refugees from Haiti. Ruins of the quarters of some of the 126 slaves held by the French-Cuban owners here can be seen alongside the driers. The attic of the master’s house (now a restaurant) was used to store the beans until they could be carried down to the port of Mariel by mule. Enjoy lunch at El Romero, a paladar that uses locally grown produce to create its meals – offering a true farm-to-table experience. Optional: Explore the San Juan River, set in a beautiful and peaceful setting or take in a Canopy tour of the forest (to be paid on the ground) to enjoy the best views of the forest and the community. Visit to La Factoría Gallery for a discussion with artists and explanation of the gallery’s latest edition, followed by a visit to Fototeca, the leading photographic guild in Cuba and the most prestigious venue for showcasing work from leading Cuban photographers. Visit the Wilfredo Lam Center of Contemporary Art, a cultural institution dedicated to the study, research and promotion of contemporary visual arts from developing countries in Africa, Latin America, Asia and the Caribbean. Visit a centuries-old mansion in Vedado neighborhood. Step inside this stately residence to discover what lies behind the crumbling facades of Havana’s impressive mansions. Josie, who has lived in the house for over 60 years, will show us around and explain its rich history. Visit to art studios and galleries, including the studio of Mabel Poblet, the studio of top artists Frank Mujica, Adrian Fernandez and Alex Dueñas, and the Merger Gallery, a collaborative studio of three top-of-the-line Cuban artists Mario González, Niels Moleiro and Alain Pino. Enjoy a tour of Callejón de Hamel, a neighborhood that has been converted into a cultural center rich in Afro-Cuba religion, art and dance. Scholar Elias Assef will provide an overview of Santeria and other Cuban religions with African routes, which will be followed by a folkloric dance performance. Spend the late afternoon with Barrio Habana at one of their community programs: Aula Ecologica, a handicrafts and games workshop for the local children. Check-out and depart for airport. (2 ½ hours before your flight departs).